Etching is a type of damage that occurs when lemon juice, cleaning products, or other acidic substances come into contact with calcite or other minerals in marble that are sensitive to acid. Notice the dull white marks in the BEFORE image. These are etches, which are often mistaken for stains or watermarks. Etching is actually a chemical reaction that roughens the surface of your stone, whereas stains won’t change the texture, just the appearance. Very mild etching can sometimes be removed with a polishing powder. Deep etch removal, however, should only be accomplished by a professionally trained stone restoration contractor. 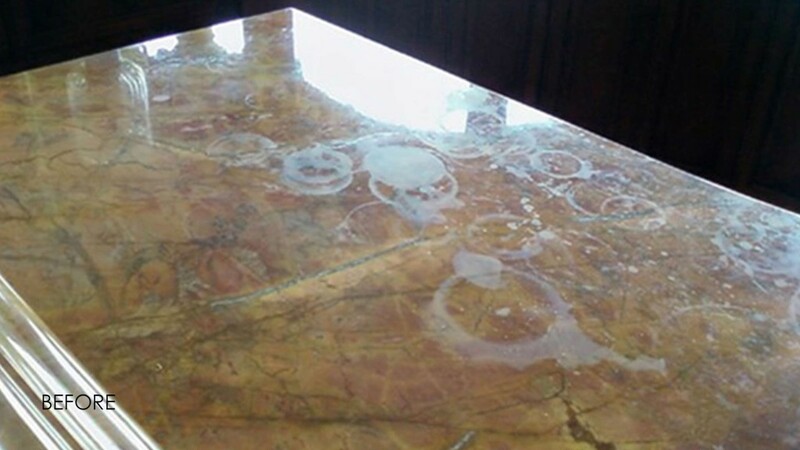 The last thing you want is to cause additional damage to your natural stone, so if you aren’t sure about the severity of etching, let an experienced technician have a look. Professional stone restoration services produce the dramatic results you see in the AFTER image. Whether your natural stone is in your kitchen, bathroom, or another area of your home, an experienced technician can expertly remove etch marks, leaving your stone as beautiful as the day it was installed. For more information about marble restoration, visit our Marble Services page. 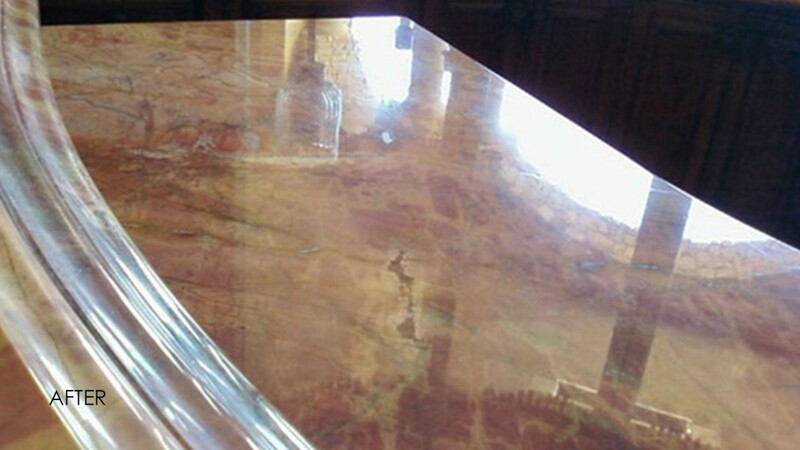 Techstone provides expert marble restoration services, including marble floor polishing. If you’re located in any of our service areas, contact us online or call 1-888-570-2859 today for a free estimate.